Citation Information: J Clin Invest. 2017;127(9):3421-3440. https://doi.org/10.1172/JCI94233. The pathophysiological function of the forkhead transcription factor FOXN3 remains to be explored. Here we report that FOXN3 is a transcriptional repressor that is physically associated with the SIN3A repressor complex in estrogen receptor–positive (ER+) cells. 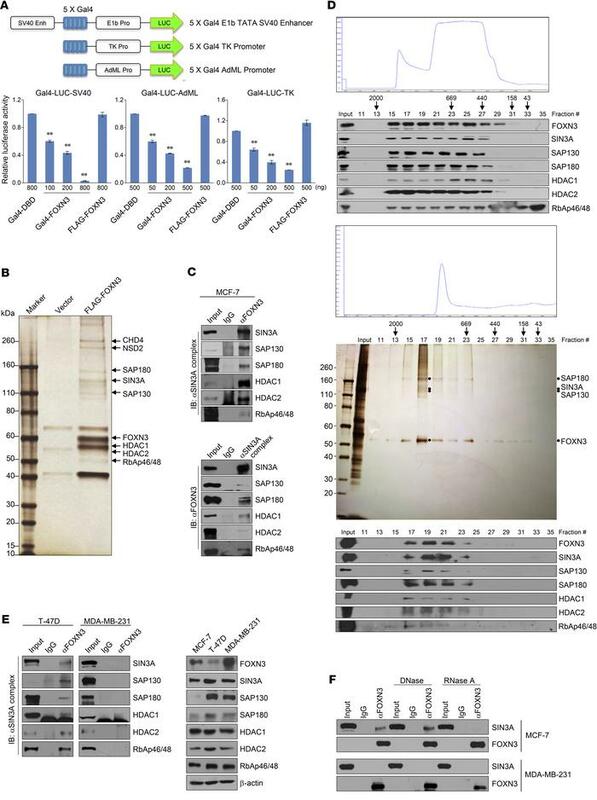 RNA immunoprecipitation–coupled high-throughput sequencing identified that NEAT1, an estrogen-inducible long noncoding RNA, is required for FOXN3 interactions with the SIN3A complex. ChIP-Seq and deep sequencing of RNA genomic targets revealed that the FOXN3-NEAT1-SIN3A complex represses genes including GATA3 that are critically involved in epithelial-to-mesenchymal transition (EMT). We demonstrated that the FOXN3-NEAT1-SIN3A complex promotes EMT and invasion of breast cancer cells in vitro as well as dissemination and metastasis of breast cancer in vivo. Interestingly, the FOXN3-NEAT1-SIN3A complex transrepresses ER itself, forming a negative-feedback loop in transcription regulation. Elevation of both FOXN3 and NEAT1 expression during breast cancer progression corresponded to diminished GATA3 expression, and high levels of FOXN3 and NEAT1 strongly correlated with higher histological grades and poor prognosis. Our experiments uncovered that NEAT1 is a facultative component of the SIN3A complex, shedding light on the mechanistic actions of NEAT1 and the SIN3A complex. Further, our study identified the ERα-NEAT1-FOXN3/NEAT1/SIN3A-GATA3 axis that is implicated in breast cancer metastasis, providing a mechanistic insight into the pathophysiological function of FOXN3. FOXN3 is a transcription repressor that interacts with the SIN3A complex in an RNA-dependent way. (A) Schematic diagrams of the Gal4-luciferase reporter constructs. For reporter assays, MCF-7 cells were transfected with different amounts of Gal4-FOXN3 or FLAG-FOXN3 together with the indicated Gal4-luciferase reporter. Each bar represents mean ± SD for triplicate experiments (**P < 0.01, 1-way ANOVA). (B) Immunopurification and mass spectrometry analysis of FOXN3-associated proteins. Cellular extracts from FLAG-FOXN3–expressing MCF-7 cells were affinity-purified. The eluates were resolved by SDS-PAGE and silver-stained. The protein bands were retrieved and analyzed by mass spectrometry. (C) Coimmunoprecipitation assays in MCF-7 cells with antibodies against FOXN3 followed by immunoblotting (IB) with antibodies against the indicated proteins, or with antibodies against the indicated proteins followed by IB with antibodies against FOXN3. (D) Fast protein liquid chromatography (FPLC) analysis of nuclear extracts from MCF-7 cells. Chromatographic elution profiles and IB analysis of the chromatographic fractions are shown. Equal volume from each fraction was analyzed, and the elution positions of calibration proteins with known molecular masses (kilodaltons) are indicated (top). Silver staining and Western blotting of FOXN3-containing complex fractionated by Superose 6 gel filtration (bottom). (E) Whole cell lysates from T-47D cells or MDA-MB-231 cells were immunoprecipitated with antibodies against FOXN3 followed by IB with the antibodies against the indicated proteins (left). Western blotting analysis of the expression level of the indicated proteins in MCF-7, T-47D, and MDA-MB-231 cells (right). (F) Cellular lysates from MCF-7 or MDA-MB-231 cells were immunoprecipitated with antibodies against FOXN3 followed by IB with antibodies against SIN3A in the presence or absence of DNase or RNase A.